Businesses are already developing ways to incorporate AR and VR technology into their products and experiences. Augmented and mixed reality (AR and MR) are being used to revolutionise numerous industries, with the retail sector being no exception. The rise of online shopping has meant that retailers have had to put more focus on the customer experience and explore new ways to gain the shopper’s attention. Fortunately, with the introduction of new technologies such as mixed, augmented and virtual reality, which blur the lines between the real and digital worlds, retailers have the opportunity to revolutionise the shopping experience, boost customer engagement and in turn improve their bottom line. While these innovations have already been used to great effect in several industries – in particular completely turning the entertainment industry on its head – mixed and augmented reality have also proven to be particularly effective tools in the retail sector, allowing consumers to engage with brands on a level which has never been possible before. Last year was arguably when we first began to see a surge in retail companies exploring this technology as a commercial tool while Apple’s clear focus on augmented reality with its ARKit tool shows that major brands are now seeing the potential of this immersive experience. Being able to preview products in a real-world setting offers all kinds of opportunities for retailers to utilise augmented reality to improve sales and the customer experience. For the most part, attempts to utilise augmented reality have been reserved for the instore experience – we’ve carried out a number of instore trials with John Lewis which have proved how popular this technology is with customers – but the online market is still largely untapped. However due to the nature of augmented reality and the possibility of customers transforming the world in-front of them on a smartphone or tablet screen, augmented reality is actually more suited to online. Augmented reality tools are far more cost-effective and convenient for businesses to implement because unlike virtual reality it doesn’t require the use of a dedicated headset to engage with the technology. All you need is a smartphone. As popular as online retail is and will continue to become it has always come with a degree of uncertainly because customers have struggled to judge how a product will look when it arrives at home. Whether it’s furniture or an item of clothing, judging whether it will look the same or whether it will fit is nearly impossible to tell from a computer screen. Augmented reality is a key to getting over the imagination gap, which research shows affects nearly one in three shoppers. According to the Centre for Retail Research, online sales in the UK alone totalled £60 billion in 2016. This means that if AR technology could convert even some of these uncertain shoppers into direct sales, it could increase profitability in the e-commerce sector by billions. Augmented and mixed reality platforms also offer benefits to those who value being able to share their purchase ideas before committing to them. Using these visualisation tools homeowners would be able to share their design ideas with friends and family before making a final decision. Our research shows that a significant number of shoppers would not make a final purchase decision without getting the opinion of friends and family first, while the ability to share ideas on social media effectively provides free advertising to the retailer. Online shopping is not going away any time soon. Consumers know they can get many products online cheaper and easier, without the added disadvantage of having to carry around an armful of heavy bags. Physical shopping can no longer compete with e-commerce on a purely transactional basis, which is why high street stores are losing footfall. This is precisely why physical shopping needs to shift from a transactional environment to one which is more experiential for customers. To drive footfall into their stores retailers need to find ways to innovate and provide shoppers with experiences they can’t get online. VR/AR will be key here, turning the previously routine activity of shopping into a more exciting, interactive experience. The priority here is giving the customer an experience they can’t get online. More and more big-name retailers are bringing the shopfront to life and embracing the concept of “retailtainment” – bringing together the worlds of retail and entertainment to provide the customer with new, engaging experiences. One great example was when North Face used VR to actually transport their customers from their store to California’s Yosemite National Park to “try out” their range of outdoor clothing in a simulated outdoor environment. This was a fantastic way to use the technology to directly influence in-store sales – using immersive storytelling to demonstrate the benefits of their products, while giving customers an experience they’ll never forget. In order for this technology to succeed in stores, it must provide the customer with a solution that balances fun with usability. Once a customer is in the store, what they need is something simple and intuitive which will lead them directly to where they want to go. Customers appreciate software that takes the hassle out of shopping and truly aids them in their purchasing decision, saving them time and money, and they’ll show this appreciation through repeat business. How will this technology look in the future? Pokemon Go was the first real success story of mixed and augmented reality in the mass market and opened a lot of eyes to the benefits of these immersive platforms. Apple has long been rumoured to be investigating how to get into the AR game and its upcoming ARKit is the first step of a major push towards the end of the year. Major brands are now beginning to see the benefits of this technology and, fearful of being left behind, are starting to bring in smaller innovative start-ups to help develop their own platforms. In fact the enterprise focussed sector of augmented reality has grown 60% in the last year. 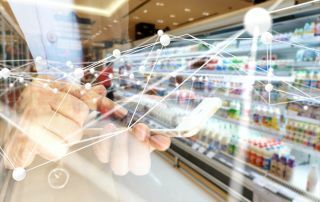 The future success of retailers using this technology will depend on how effectively they can work with the mobile technology now available to address the specific issues their customers face. For the VR market, inexpensive wearable solutions such as Google Cardboard and HoloKit have already proved to be a hit with consumers; combining the technology most people have in their pockets with cheap, mass-produced cardboard headsets, which anyone can buy. For the AR and mixed reality market, many experts are predicting that using technology, such as that developed by Digital Bridge, to overlay retail products into the real world so you can try before you buy will become closer to being seen as the normal way of shopping - for both consumers and retailers - before the end of the year.